The concept of all centralizing all communication methodologies (presence, instant messaging, voice, video, and messaging services) within a single system, a.k.a. unified communications or UC, is not new. The vast majority of medium and large enterprises have deployed some form of UC solution. A Wainhouse Research Q4 2015 survey of 100 enterprise IT decision makers revealed that 96% have deployed at least one unified communications platform. One of the most popular platforms is Microsoft. In fact, Microsoft has indicated that it has 110 million Skype for Business or Lync users around the world. 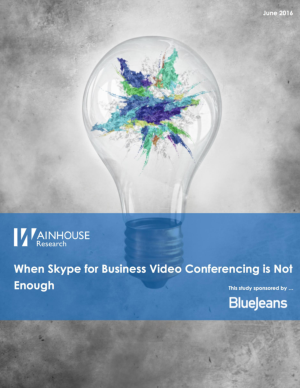 However, many organizations have yet to fully embrace the video conferencing capabilities available within Skype for Business / Lync. Overall we view Skype for Business (SfB) video conferencing as an excellent choice for sessions involving only SfB users. It is especially well suited for impromptu, two participant (point-to-point) communication sessions. However, the SfB experience is focused more on content sharing and less on live video, and SfB’s multipoint calling features are somewhat limited. Furthermore, SfB lacks some call control features and management functions that admins may need to support their video environment. There are times when Skype for Business doesn’t deliver the video experience or meeting access users expect. Download this whitepaper to learn 12 situations in which users may wish to use a different video conferencing tool. In this paper, Wainhouse also compares two options for companies seeking better video capabilities. Wainhouse Research is an independent analyst firm that focuses on critical issues in Unified Communications and Collaboration (UC&C). This study was sponsored by BlueJeans Network.